Gauhati High Court Notification is out. Gauhati High Court is recruiting for 16 Judicial Assistant Govt Job Posts. You can check Gauhati High Court - Gauhati High Court last date, download Gauhati High Court notification, visit Gauhati High Court official website and check other Gauhati High Court Vacancy details.Complete Vacancy and recruitment Details about 16 Judicial Assistant Govt Job vacancies in Gauhati High Court are provided below by JobSarkari.Com only for you. Last Date for Apply Online. 14/02/2019. SC / ST(P) / ST(H) Rs.150/-. Mode of Payment Application Fee Can be Submitted through Online Mode or Offline through E-Challan. Judicial Assistant 08. 05. 03. 00. 00. 16. Candidate Must Have Passed Graduation and Having Working Knowledge of Computer. For General (Including OBC/MOBC) Maximum 44 Years. For SC Maximum 49 Years. For ST(P) And ST(H) Maximum 49 Years. For PH Maximum 54 Years. 6.Online Application Can be Submitted on or Before 28th February 2018. Q. 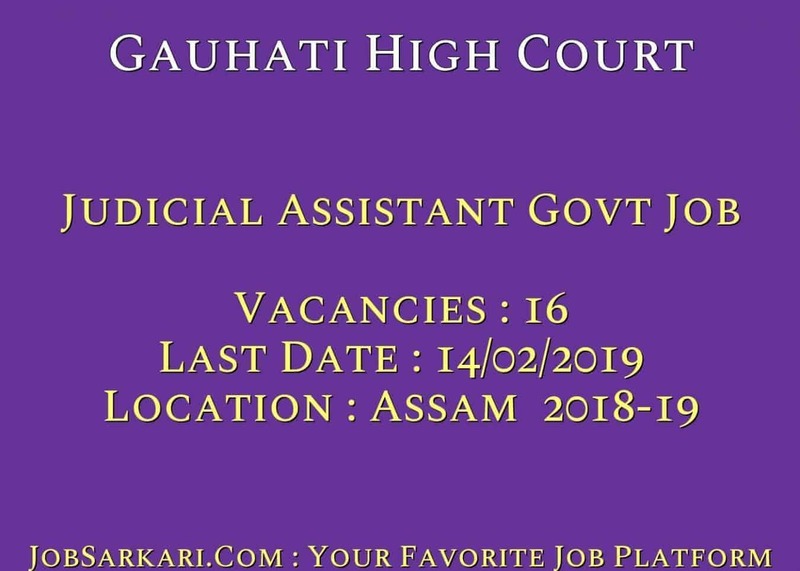 What is the Last Date For Gauhati High Court Judicial Assistant Govt Job Vacancy ? A. 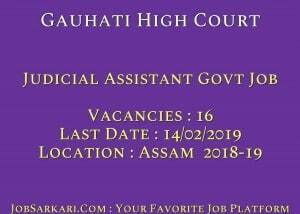 Last Date for Gauhati High Court Judicial Assistant Govt Job Posts is 14/02/2019. Q. What is the Form Type of Gauhati High Court Judicial Assistant Govt Job Recruitment ? A. The Form Type for Gauhati High Court Judicial Assistant Govt Job Posts is Online. Q. How many vacancies are available in Gauhati High Court Judicial Assistant Govt Job Posts ? A. There are about 16 Vacancies in Gauhati High Court Judicial Assistant Govt Job Posts. Q. What is the Full Form of Gauhati High Court ? A. Full Form of Gauhati High Court is Gauhati High Court .